On this page, you will find a model CV form that will improve your job prospects at the drop of a hat. Download the 2015 Sample CV form to your computer and open it in MS Word or Open Office. Are you looking for instructions on how to create and write a compelling CV? Or are you looking for information on how to write a flawless motivation letter? If so, you’ve come to right place. Please read on. The CV is an incredibly important document. It‘s not a good idea to take it lightly! Well, finding this page on the crowded Internet proves that you’re probably already aware of this fact. Perhaps you’re currently unemployed, have a badly paid job, are annoyed with your boss or you’ve been given your two week’s notice... No matter the cause, it’s quite clear that sooner or later you will certainly need a sample CV. IMPORTANT: A CV can be interesting and efficient, but it can also be boring and dull. In today’s world, everything is getting faster, growing and developing at lightning speed. Those who are not able to keep up lose out on many opportunities. Unemployment is permanently increasing and the competition amongst job seekers is steadily growing. If there were 5 applicants for a job 10 or 20 years ago, nowadays there are 10, 20, and in some professions even 50 applicants for the same job! This is the logical reason for the increased demands placed on employees and the fact that companies ask a lot of their job applicants. Read on if you want to know how to succeed! It’s nearly impossibly to succeed today without a CV. No matter where you apply, you will rarely find a company that doesn’t request some form of a CV. A sample CV is, in fact, nothing less than a complete cross-section of your life—not only your work experience up to the present day, but also the highest level of education you’ve achieved. A CV or résumé with a photograph is much more credible! Don’t believe this misguided suggestion, please. It’s definitely true that an HR worker may place quite a lot of importance on an applicant’s appearance. But this is absolutely fair. The owner of the company has the right to seek an employee who will not only be of the highest-quality, but will also make an agreeable impression on the partners and suppliers of the company. Save time and do things more efficiently. You will save your time if you attach a photograph. If the employer weeds you out on the basis of a photograph, you not only save your time, but also the energy you’d spend preparing for an interview in vain. You may perhaps argue that it’s not "fair," but these are just the facts—it’s useless trying to find a solution for something you have no influence over. 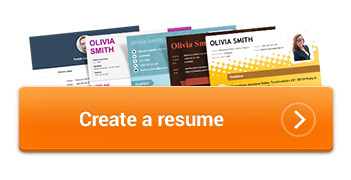 Continue by clicking on the structured CV form. This will bring you our guide on how to complete your own CV template.